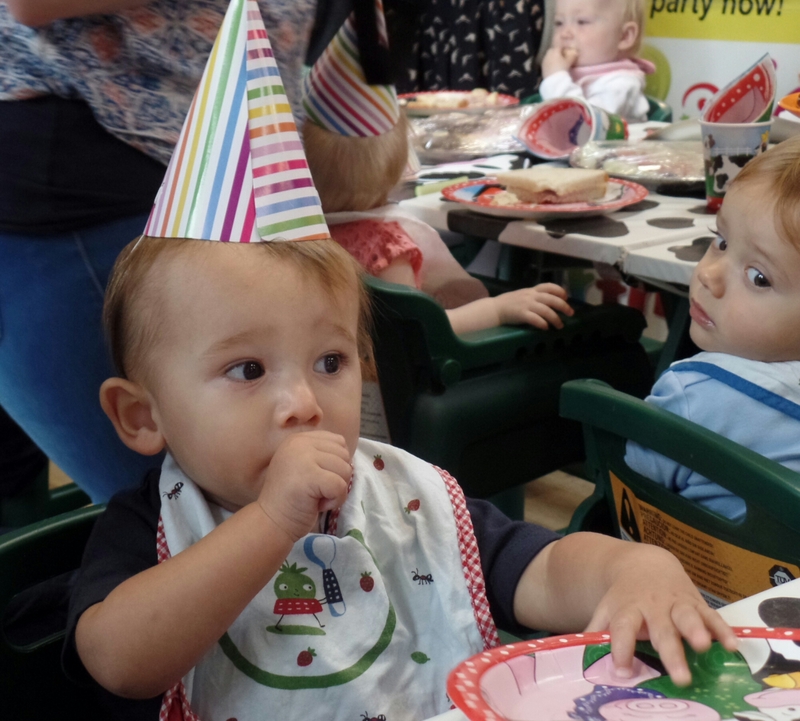 Just back from a birthday party organised for 9 babies all around the 1 year old mark. 9 babies, 16 adults and some food in a soft play area. Add some farm animals and a cake and you have all the ingredients for a good party. Unfortunately we are in England and it rains… a lot! I guess that a party for 1 year olds is never going to be for the children. Surely not! It is a celebration for the parents and today it was all about us. 16 perfectly normal adults who had their lives turned upside down 12 months ago, but survived a full year of parenthood. Not bad, if I can say so myself. The kids had some food, munch on some fruit, wear funny hats and play with the tractors, they also found some time to look at a couple of goats and pigs. The adults, on the other hand, had a chance to get out of the house! If I think of myself going out to enjoy a summer bank holiday more than 2 years ago, I can picture the beer garden or the green laning with the Land Rover. On a sunny day we could have even adventure for a nice walk in the English countryside. I would have never imagine that one day I would have eaten half a burger (no time for a whole one), in between changing a nappy and opening a present, while Smiley Riley was shouting to a bunch of 3 year olds to clap with his song. How life has changed, uh? It is remarkably interesting to talk to people that are going through the same phase in life as you. It was essential when the babies were a few weeks old, it is reassuring and entertaining a year later. We learned so much from each other, we discussed sleepless nights, poo colours and weaning techniques. We evolved from adults to parents. We adapted to our new lives and changed our understanding of what it means to be a family. We changed. 10 things that you would not do… unless you have children! The twins are almost a year old, but I can still remember my life before babies. These are 10 things which I would have never done 12 months ago, but I do regularly now! 1 – Eating fish fingers for dinner. When you don’t want to cook two different dinners, they always work! 2 – Talking about poo… no further comments needed. 3 – Sit in a ball pit. Although I have to admit that it tends to overflow when I sit in it! 4 – Going around with a teething gel in my pocket. It used to be paracetamol or something useful against headaches, but now I don’t have time to have a headache anymore. 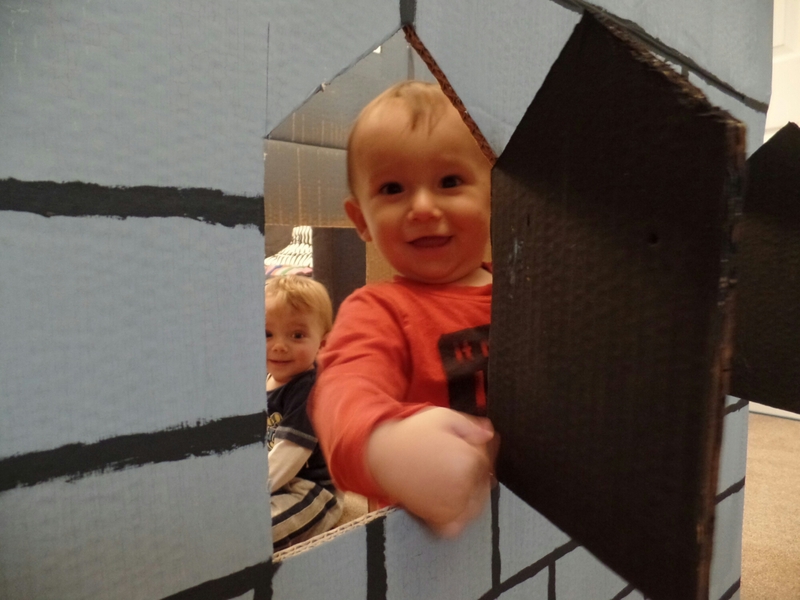 5 – Having a cardboard castle in my living room! 6 – Singing Old McDonald’s Farm. Out loud. In a public place. In front of strangers. With a smile on my face! 7 – Having a cup of tea when you have time for it, not because you want one. Not sure you can really understand the tragedy of this, unless you’re English or live in the UK. 8 – Being late for everything. Despite all my strength and all of my organisational skills, I can’t seem to be on time anymore. What’s make it worse for me, it is that my previous life I used to be always early. So I guess that in a way things haven’t changed much: I never did and I never will arrive at the right time. 9 – Knowing how to tell the time depending on the cartoon on the kids channel, not by using a watch. 10 – Writing a blog. I guess that despite everything, my life wasn’t that interesting up to 12 months ago then. Animals and children never follow instructions or do what they are supposed to do at the right time. Yesterday we found out how hard it can be to take a nice family picture. And we don’t even have any animals! The day was perfect, 26°C, sunny and with a light breeze. The location was perfect, a lovely little lake with plenty of trees and blue sky. The clothes were perfect and coordinated not to have clashing colours. The camera was perfect, digital SLR Canon with the appropriate lens for portraits. As we arrived a little late, we decided to feed them before taking any pictures. Despite two bibs (each! ), T managed to put some food on his shorts. Not a problem, I thought, it can be photoshoped out of the photographs. Let’s carry on and try to take some decent pictures. The weather was so perfect that the boys fell asleep in the pushchair while walking around the lake after lunch. I would have done the same if someone wanted to push me along the path in that heat. Once again I thought it wasn’t going to be a problem as we had lots of time and we definitely didn’t want a pair of grumpy tired twins in a family portrait. Let’s carry on and try to take some decent pictures. After they woke up, we found a nice spot on the lake. The light of the sun was tickling the surface of the water creating this brilliant effect. It couldn’t be better. No one was around, except for a lonely fisherman, so we could finally take a couple of pictures. After the first 2 minutes though, a pair of school kids arrived loaded with bread for the ducks. The boys had a lovely time watching the ducks fighting for the bread, but the pictures had to be postpone. Let’s carry on and try to take some decent pictures. After another short walk, we stopped by a small bay with very shallow water. Unfortunately someone decided to let the boys paddle in the water and their shorts got very wet. Not a good omen for the next set of pictures. We tried anyway. After the boys had a good time playing and splashing, we found a nice spot with a lovely carved wooden bench and we sat for our family portrait. For sat, I mean mummy and daddy sat down, B and T had other ideas. B put himself upside down and start laughing uncontrollably, while T really wanted to taste the wood shaped like a swan… All in all, not the best “pose” for the perfect picture. I had enough, it had been a nice day outdoor, but the chance to take a decent picture had clearly faded away. Let’s carry on and… go back home! When you do a craft project for your children, is it really for them? I asked myself this question a few times while working on my latest idea: a medieval castle. 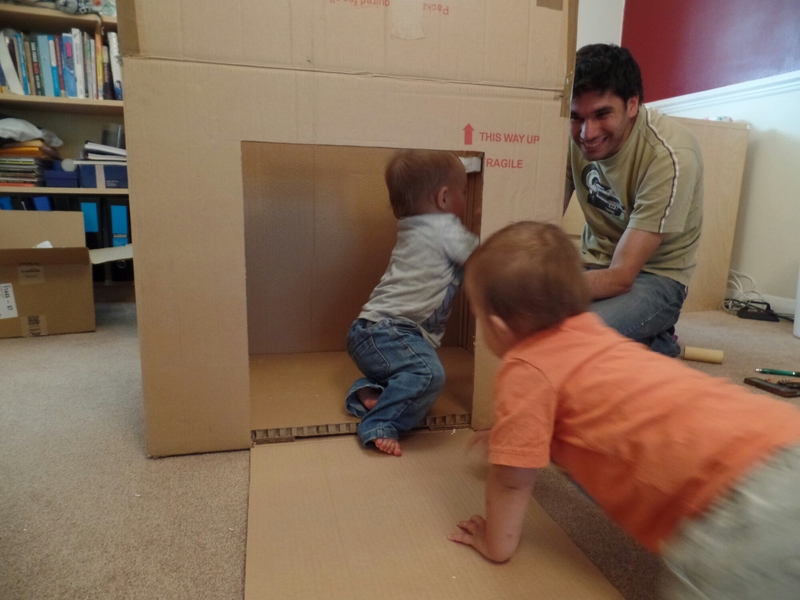 The twins would have loved the box as long as it had a door to get in. If we had time to cut in a window or two, they would have laugh at us while looking out. 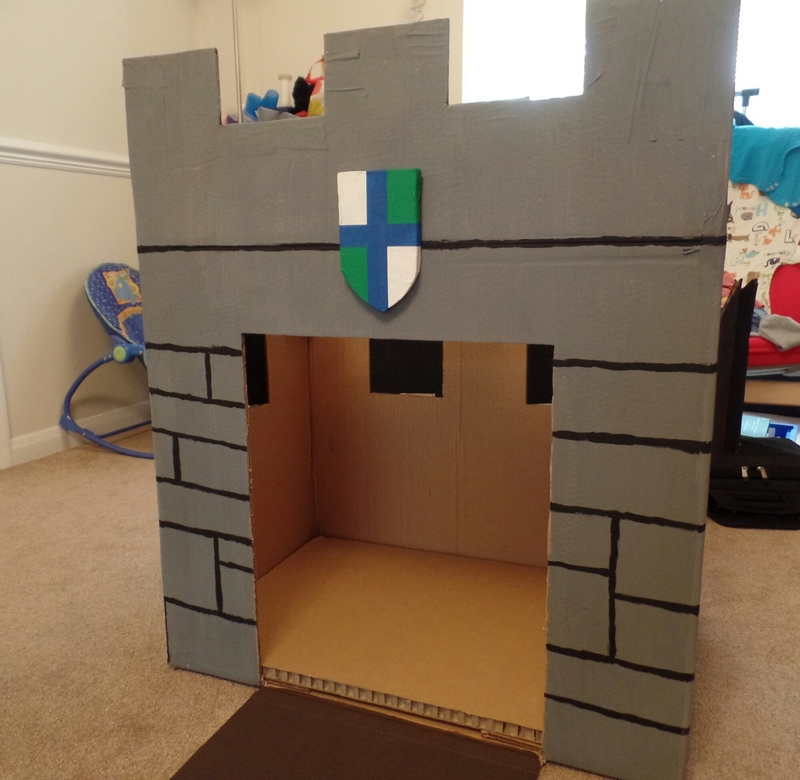 So why did we (my husband and I) built a proper castle with a draw bridge, towers, windows and then not happy with one coat of grey paint, we also spent time adding fake stones to the paint job? Surely not for our 11 months old twins. They have never even seen a castle before! Lately my brain has started to work in a funny way. Between the hours of 6 AM and 8 PM, I am the mum. I’m responsible, reliable, serious, busy, extremely busy, very very busy and mostly importantly, I cannot stop for a second. After 8 PM, when the boys are in bed and the husband is cooking dinner, I transform into a 5 year old who wants to build castles out of cardboard boxes. So when my husband took home a pair of coffee table in an old box, my brain started to formulate ideas, draw blue prints and imagine a world of possibilities. Apparently I have also married the right person to help with my crazy ideas, because as soon as I explained what I wanted to do, he went to the garage and reappear a few minutes later with everything we needed and more… Did we really need a spirit level to cut the windows straight? Did we need a coat of arms to put at the entrance of the castle? Obviously not. Definitely we didn’t need multiple designs and a 30 minutes consultation on how to paint it. And were two coats of paint of the draw bridge needed, because the first “didn’t look quiet right”? I would guess not. Was it fun to do? Oh yes! So the answer to my original question is undoubtedly no, it’s not for them. The craft project is probably something you would have liked to do as a child, but couldn’t; it is a way to unwind at the end of a long day; it is an unusual way to bond with your husband when you can’t go to the cinema anymore and finally it is a way to get amazing pictures of your twins to put on Facebook! If you would like to attempt a craft project, I would start with something smaller. We probably spent an hour reinforcing the towers, couple more cutting windows and the bridge, 3 or 4 hours painting it and a whole week taking super cute pictures of the boys playing with it. It was definitely worthy! I distinctly remember visiting a friend with a 4 weeks old baby and thinking that being a parent cannot be that hard. The baby was perfect. He didn’t sleep much (which at the time I thought it was great as I was there to see him), drank all his milk, looked around while we were having lunch and then fall asleep on our pleasant walk along the seaside. Who wouldn’t want to spend a day like that? Who would think that parenting could be hard after such an example? 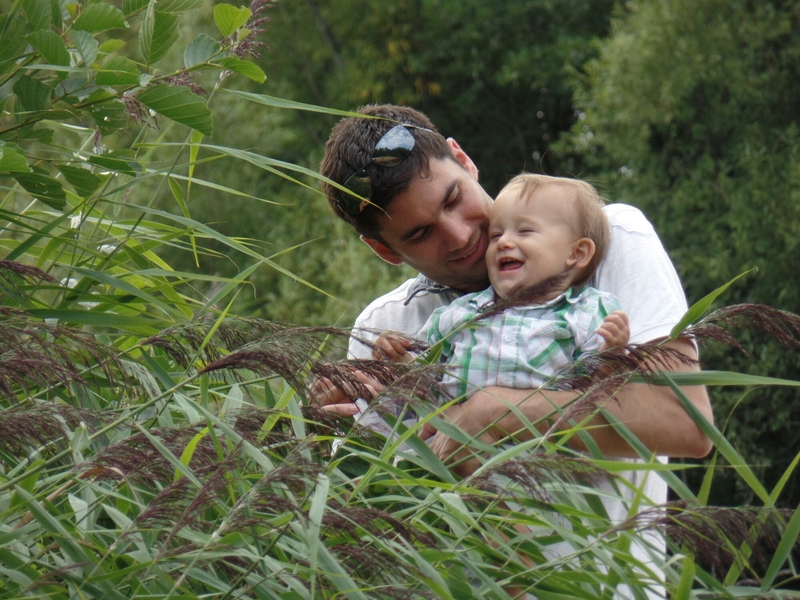 My friends did warn me that he had never behaved so well before, but I clearly must have ignored them, because a few months later my husband and I started trying for a baby. Today, more than two years later, my mother and I took the twins to my sister. If my mother wanted to take the boys to convince her she should have kids, she was wrong! The encounter couldn’t have gone much worse. You need to know that my sister has no intentions of becoming a parent, but she is also 30 and married (and probably our mother asks her about kids once a week!). She has met the twins a handful of times and strongly believe that all children hate her. It all started when we told her that B can now “high five” people. She tried and he gave a high five to everyone in the room but her. My mother tried to convince her that it can happen and that it wasn’t personal. No harm done… yet. The boys behaved well till lunchtime and then sat nicely in their highchairs while we ate some pasta. By the end of our meal it was time for their lunch, my mother was waiting for this moment has her ace of spade. The twins eat really well for their age, they are not messy, they eat everything and they are very patient. We had a meal that they really like, large bibs to avoid food stains (just in case) and two highchairs despite being away from home. Nothing could have gone wrong! If you have a baby or two, you know that they never respect your plans. T intercepted one of the spoonfuls and spread the food all over his head. At the same time B decided to eat only some of the ingredients in his food, spitting out everything else. He had never done that before, what a time to start! After a good clean up and a long walk, we came back home to find out that B had a fever! We didn’t have any infant paracetamol and it was too hot to put him in a car seat for an hour journey. To cool him down we decided to put him under a cold shower. You can imagine the amount of screams! It worked, but it also scared my poor sister, who thought saw the worse of it at lunch time. They didn’t play with each other nicely, they didn’t make all those cute noises that babies do, but they almost definitely convinced my sister that having children is the last thing she wants to do! From B and T: sorry nonna but it looks like we will be your only grandsons! 1- You don’t buy wipes at the supermarket like everyone else, you have an Amazon monthly standing order. 2- Nappies are bought in bulk of at least 150. The 25 nappies pack is the equivalent of a shot on a pub crawl. 3- Your pushchair weighs 30 kg… without any babies on it. 4- You obviously have two of everything: toys, spoons, car seats, coats, bath toys, except for the mum… There is only one! 5- Even after they start sleeping through the night, the bags under your eyes still touch the floor.